Raytheon has unveiled a rifle optical technology designed to help military customers identify targets and obtain situational awareness when they operate in close quarters. ELCAN Specter 1XL is equipped with LED technology, multiple reticle options and a large high-transmission window that allows ground forces to keep both eyes open during missions, Raytheon said Wednesday. 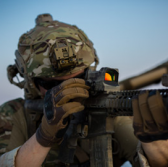 Dan Pettry, product manager for rifle sights at Raytheon’s ELCAN Optical Technologies business, said the company developed the reflex sight for soldiers to view images when used with a magnifier. The technology also works to switch between red-dot and red-dot-with-circle patterns while retaining image quality. Multiple allied militaries currently assess Specter, the company noted.